Review posted January 20, 2018. Doubleday Books for Young Readers, 2017. 152 pages. Oh, this is such a lovely book! The story is based on 16 pages of notes discovered in Mark Twain’s papers. 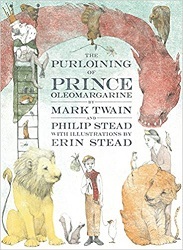 It was discovered by a researcher hoping to write a Twain cookbook – found because of the word “Oleomargarine.” Mark Twain House & Museum authorized Philip and Erin Stead to make a book from those notes, which were based on a story Mark Twain spun for his daughters at bedtime while in a Paris hotel. “How did she know she was a fairy?” I asked. The story turns out to be a gentle one – about a boy named Johnny who, through his kindness, receives the gift of understanding the speech of animals and gains a family of animal friends. The animal friends are observant and know what happened when Prince Oleomargarine disappeared, so they tell Johnny. The story is presented in picture book format, with Erin Stead’s delicate woodcut illustrations on each spread, and many spreads with few words or no words at all. It’s a book to savor slowly and would make magnificent classroom reading or for reading aloud at bedtime for a sequence of nights (imitating the original creation of the story). Okay, I was browsing through the book for the delightful language, and found a part I simply have to quote. This is supposedly what Mark Twain said to Philip Stead as he was relating the story, and is off on quite a tangent from the tale of Johnny. It started with a skunk who was the first to befriend Johnny. “Of course,” he added, “I could have saved myself – and Johnny – from the silly prejudices of the unenlightened. I could have lied and said porcupine or kangaroo instead of skunk. “Napoleon,” he explained, “lied to his men at Waterloo. He said: We are going to have a great time! They did not. “King Henry VIII lied to Anne Boleyn, and the whole thing caused nothing but headaches. “Consider George Washington. He made an awful stink about the nobleness of truth telling after the fact, but the sad reality is this – he looked that cherry tree in the face and told it: This won’t hurt a bit. Spend some time savoring this uplifting and ultimately very silly story.